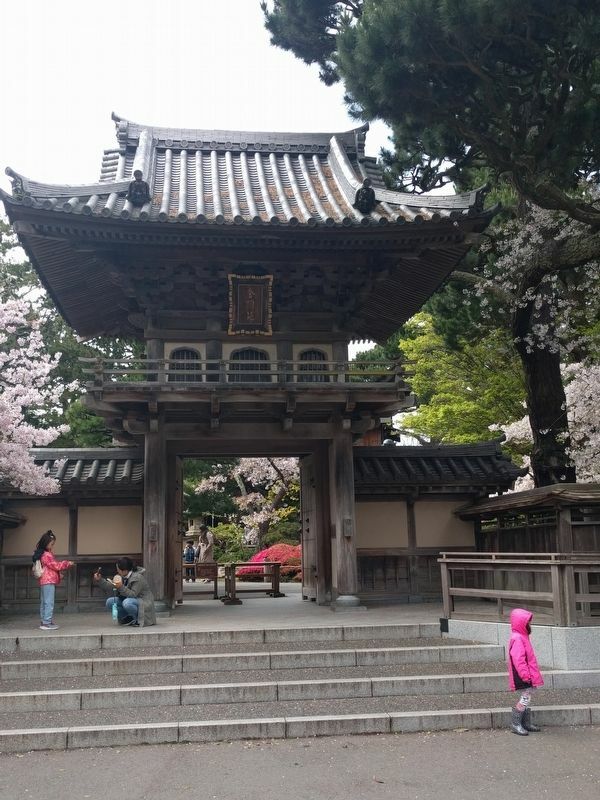 The reconstruction of the Japanese Tea Garden gates was the result of efforts by San Francisco Mayor Dianne Feinstein and Mayor Yasushi Oshima of our sister city, Osaka, Japan. The gates were designed by Ohbayashi Corporation while the traditional decorative features were executed by temple architect Kensuki Kawata. The gates stand on the site of the original ones built for the 1894 California Midwinter International Exposition and the Panama-Pacific International Exhibition of 1915. The project, under the direction of the San Francisco Art Commission, was completed on September 3, 1985. Location. 37° 46.216′ N, 122° 28.171′ W. Marker is in San Francisco, California, in San Francisco City and County. Marker can be reached from Hagiwara Tea Garden Drive north of Martin Luther King Jr. Drive, on the right when traveling south. Touch for map. The Japanese Tea Garden is just south of the de Young Museum next to the Music Concourse in Golden Gate Park. The marker is inside the Japanese Tea Garden Gate, to the right and next to the ticket booth. Marker is in this post office area: San Francisco CA 94118, United States of America. Touch for directions. within walking distance of this marker. 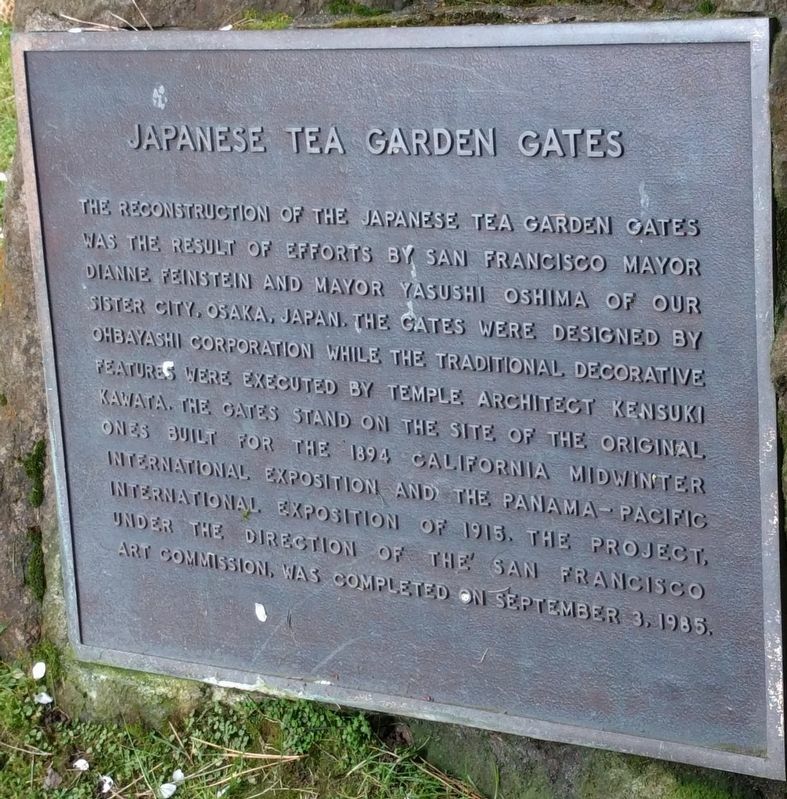 Japanese Tea Garden (within shouting distance of this marker); Golden Gate Park: A Brief History (about 500 feet away, measured in a direct line); The California Midwinter International Exposition (about 500 feet away); The Music Concourse (about 500 feet away); The California Academy of Sciences (approx. 0.2 miles away); The de Young Museum in Golden Gate Park (approx. 0.2 miles away); The Doughboy (approx. ¼ mile away); Historic Trees (approx. ¼ mile away). Touch for a list and map of all markers in San Francisco. More. Search the internet for Japanese Tea Garden Gates. Credits. This page was last revised on April 14, 2019. This page originally submitted on April 14, 2019, by Joel Seewald of Madison Heights, Michigan. This page has been viewed 30 times since then. Photos: 1, 2. submitted on April 14, 2019, by Joel Seewald of Madison Heights, Michigan. Editor’s want-list for this marker. Far view of the marker. • Can you help?